Product #1866 | SKU JAA013DA | 0.0 (no ratings yet) Thanks for your rating! A supremely lightweight lens that offers the more economical f/1.8 aperture (compared to the 50mm f/1.4 D), yet still retains the great advantages of the D distance technology. Ideal for scenery or full-length portraits. Weighs just 0.156kg, making it great for travel while still offering excellent low light gathering properties. Stops down to f/22 for wonderful control of depth of field. 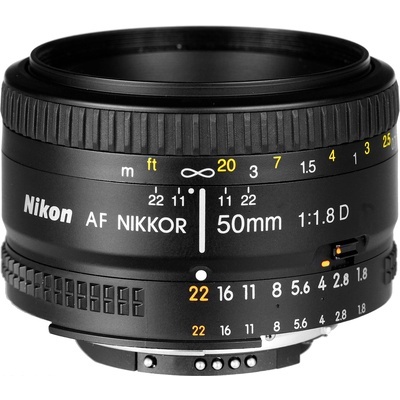 Accepts 52mm filters and the HR-2 lens hood. D-type lens design provides distance information as part of flash and ambient light exposure processes. Multi-layer coating minimizes flare and ghosting. Exceptionally lightweight and compact. Ideal for travel photography. Classic normal lens provides speed and compact design. Stops down to f/22 for excellent depth-of-field control.